You launch the application by pressing the Jottacloud app icon on your device home screen. The photo timeline has two main screen layouts. Photos and Albums. The default view is Photos. You can switch between the two screens by pressing the tab buttons at the bottom of the screen. 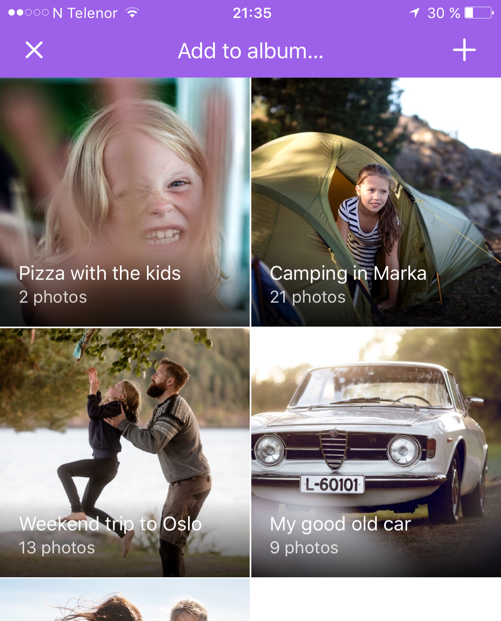 The Photos tab is view of all your photos and videos. It shows both photos stored local on your device and photos stored in the cloud. This way you have ALL your photos available wherever you go. Photos are are organized by time. The latest photo is in top. The oldest photo at the bottom. 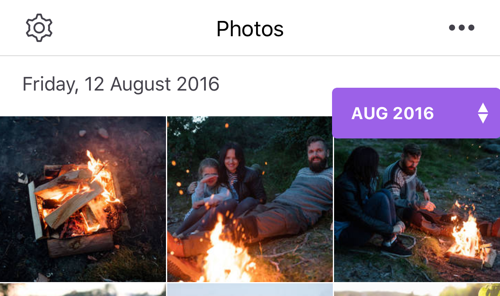 Photo capture dates are extracted from photo metadata. Photos are grouped by day. 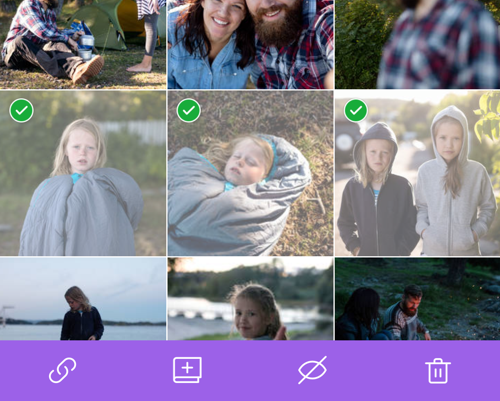 To display older photos, simply swipe up on the photos list to scroll down. Scrolling through many thousand photos can be time consuming, so you can use the "scrubber" to scroll down super fast. The scrubber will display as soon as you start scrolling. You can drag the scrubber down to scroll by month instead of photo by photo. Just press the up/down arrows on the scubber and drag. 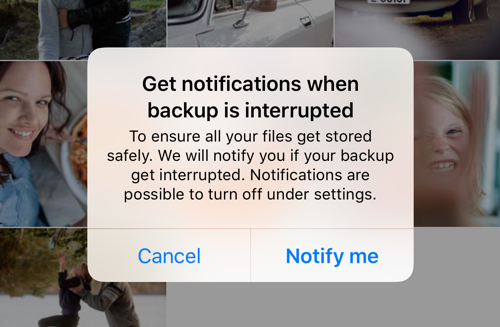 When you start Jottacloud on iOS for the first time, we will ask you if you want to enable automatic backup. To enable automatic backup of photos and videos, simply press the Enable button. iOS puts restrictions on how much background run-time every app can use (read more about background uploads here). Therefore an ongoing backup can get interrupted. Jottacloud can notify you when this happens, so that you can make sure that all photos and videos are get uploaded. Press Notify me in the dialog to enable notifications. Then you have to give Jottacloud permissions to display notifications. 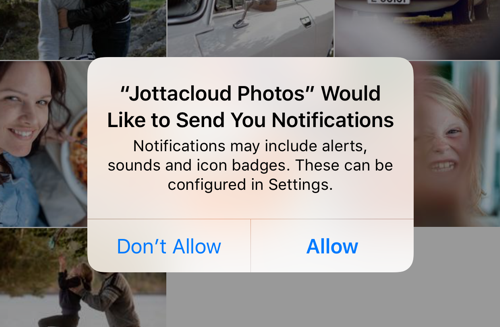 When Jottacloud discover a photo or video that has not been backed up, it displays a small badge to illustrate it is not stored in the cloud. During backup, a spinning synchronize badge is displayed. Once the file has been safely backed up, this badge is removed. 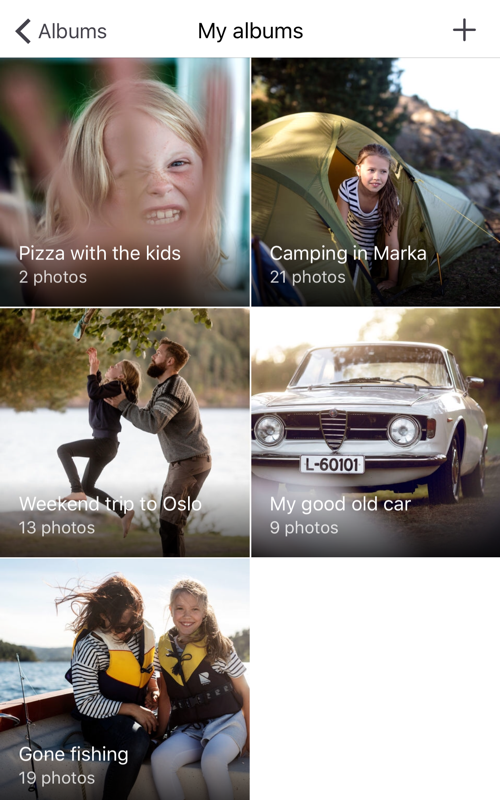 Photos without badges have been successfully backed up to Jottacloud. You can also see the number of photos and videos remaining to be backed up at the bottom of the screen, above the photos and albums tabs. When the backup progress bar is hidden, there are no new photos to back up. 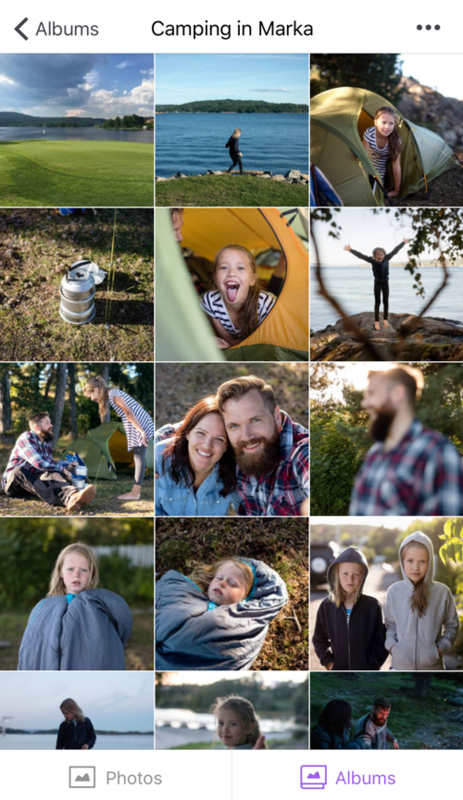 Use the options menu (top-right) and choose "Select"
Once you are in select mode you can select multiple photos. To deselect a photo. Press the selected photo again. 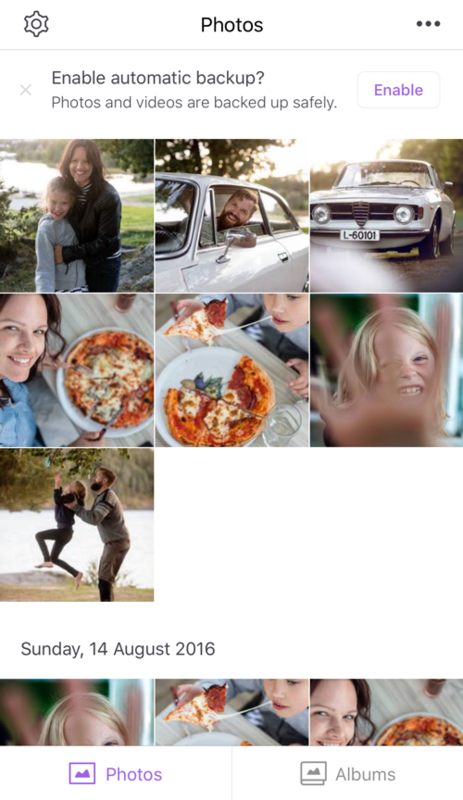 To deselect all photos, press the top-left X. 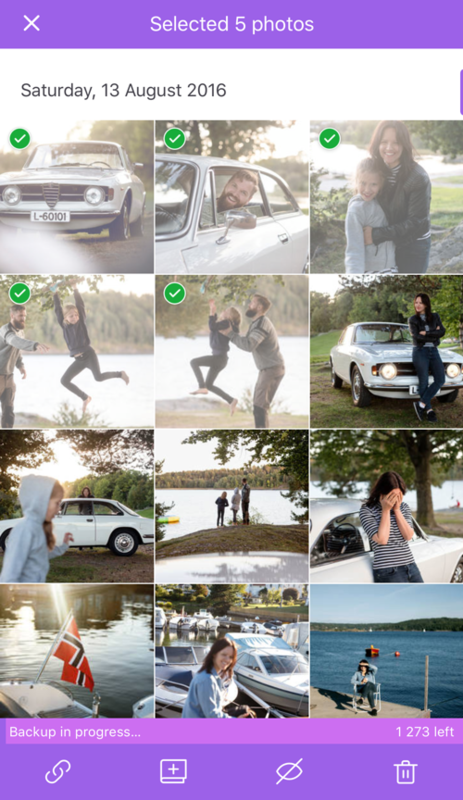 Any time you select a photo, you can add it to an album. Simply press the Add to Album icon in the select bar, then choose the album you want to add it to. 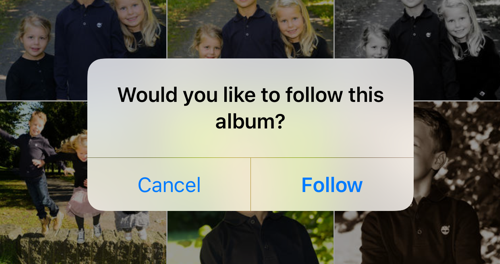 If you don't already have an album, you can create a new one from the same dialog by pressing the plus sign. Tapping a photo or video in the timeline or in an album will open the photo in fullscreen. To start a video playback, simply press the Play arrow on the screen. You pause playback by pressing the Pause symbol. You can seek in the video by dragging the playback slider. The Albums tab is an overview of the albums you have created and shared. It is also the place where you will find albums you follow from other users, and a list the places your photos was captured. To open the Albums view, simply tap the Album Tab at the bottom of the screen. You can open an album by simply pressing on the album cover. There are three album groups; My albums, Shared albums and Places. To display all albums within a group, you press the text group title or number of albums for the group. My albums is a collections of all the albums that you have created. The My albums list is sorted by modification date. The album you laste edited is displayed at the top. 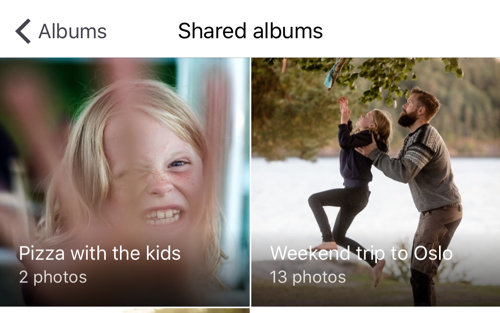 Shared albums is a list of all the albums you have shared, and the albums you are following from other users. You can press the plus sign at the top right of the album list to create a new album. Then simply add a title of your choice and press the check mark. When you open an album, all photos in the album is displayed. Swipe up to scroll down and press a photo or video to display in full screen. 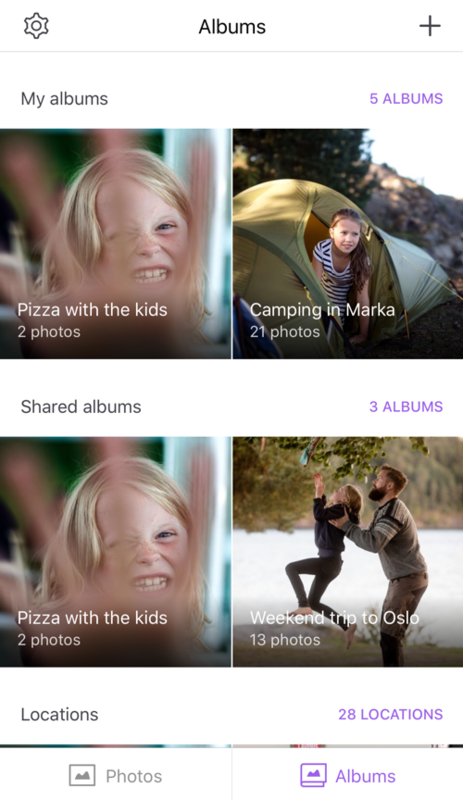 To share an album, you simply press the purple share button at the bottom of the screen. This will create a share URL and open the share dialog on your device. From the share dialog you can select how you want to share the URL. The three horizontal dots ... at the top right of the screen will display the options menu. Album settings lets you control the properties of an album. 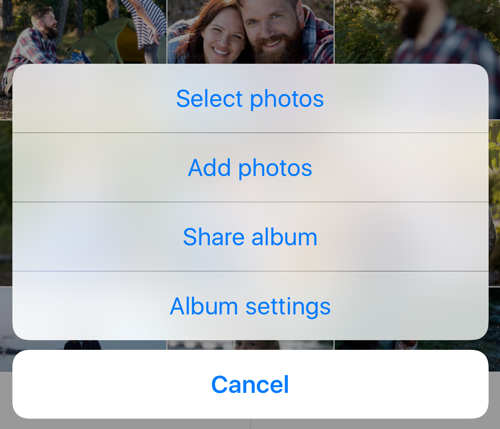 You can change sharing properties such as unsharing an album or enable / disable other people to add their own photos. You can also se the list of people following (subscribing) to your album. At the bottom of album settings page you can delete the album. To delte an album just press the Delete Album option under Album settings. 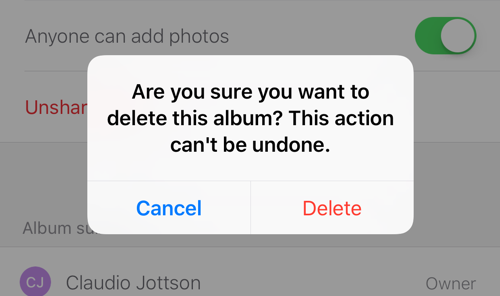 Then confirm that you want to delete the album. If you are following (subscribing) an album, you can not delete the album. Instead you can leave (unsubscribe) the album. The owner of the album will be notified when you leave the album. 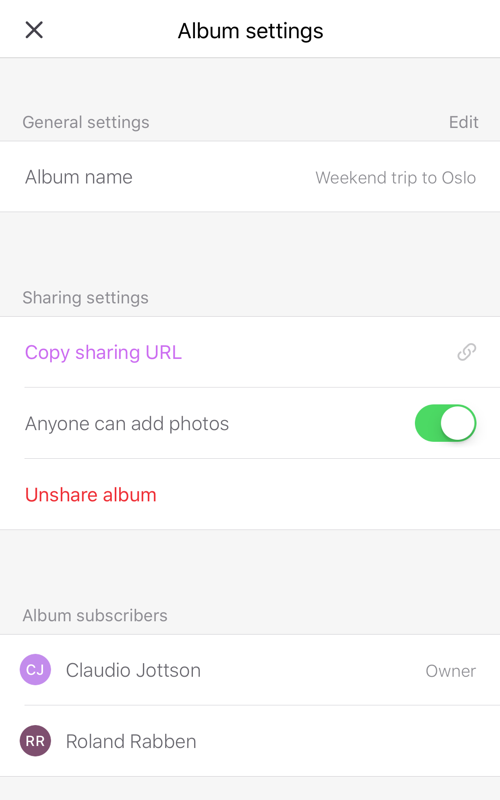 If you receive a shared album URL and click on it in any other app on your device, the album will open open Jottacloud. When the shared album URL opens in Jottacloud, you have the option to follow (subscribe) the album. Simply press FOLLOW near the bottom of the screen to follow the album. You enter settings by pressing the settings symbol near the top-right on the Photos tab or the Albums tab. Usage information is displayed at the top of the settings page. Here you can see the account name and total amount of used storage. Under BACKUP settings you can enable and disable automatic backup of photos and videos. If you disable Automatic photo backup, no photos or videos will be uploaded to Jottacloud. 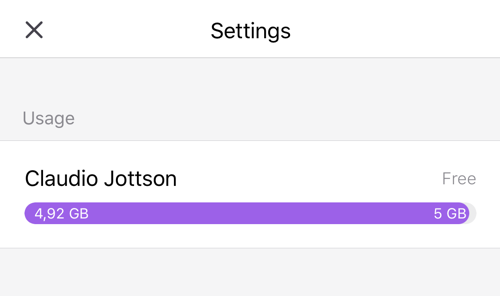 By default, Jottacloud will only backup photos and videos when you are connected to a wifi network. 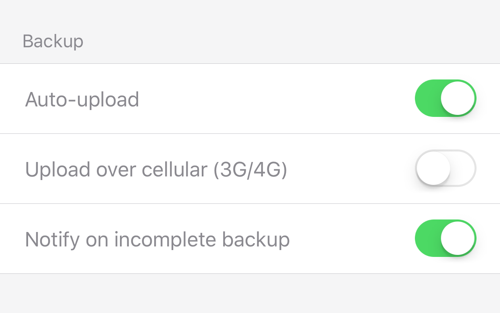 To enable backup over cellular netwoks, turn on the "Upload over celluclar" option. 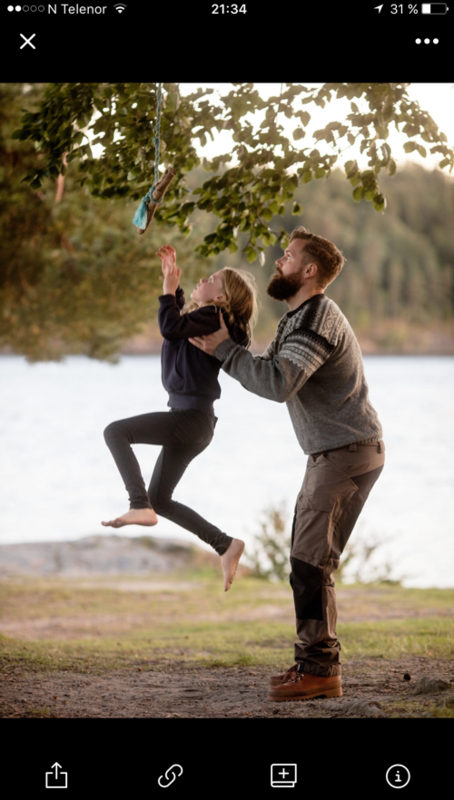 Jottacloud can free up storage space on your device by deleting photos and videos that are already safely backed up to Jottacloud. To free up space, simply press "Free up space on device". Jottacloud will then tell you how many photos and videos can be deleted, and how much space you can free up. You can also view help articles and submit support tickets under the "Help Center" option. App version displays the version number of the app. To log out of the app, press "Log out". This will require you to log back in the next time you open the app.